My Depala deck is called "Can she see over the dashboard?" Some cards i like using that may or may not fit your deck include Crackdown , Aerial Modification , Peacewalker Colossus , Citywide Bust and Braid of Fire . Braid of Fire gives Depala tons of free mana to use pulling out artifacts and dwarves. I started with "dwarves in tanks" and have moved more to "dwarves in airplanes". I would drop a few of the smaller, non-flying vehicles, Jhoira's Familiar and Foundry Inspector . Your artifacts are already pretty cheap. Is the Sun Titan really helping? Maybe replace Fumigate with March of Souls so you have some creatures to crew vehicles after the boardwipe. One really amazing card in Hateflayer . You can tap him to crew a vehicle and untap him to rain withering hell on your opponents. If you have 9 mana you can untap him 3 times for the same vehicle if you want. He destroys indestructible creatures. I wouldn't say that this deck's Lex Luthor is Animar. 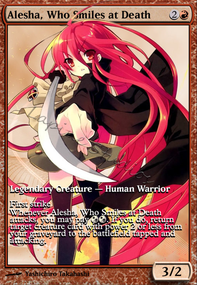 Protection prevents DEBT, as previously stated, but BW's best attribute is board wipes and secondary card draw. Protection doesn't stop wipes and Animar decks (unless they are colorless morph/bounce/combo decks) are notorious for overcommitting to the board. 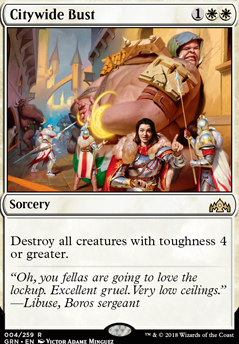 Cards like Citywide Bust , Slaughter the Strong and Council's Judgment can hate on the Animar player, (and not kill your important stuff) while still having game against more casual creature based decks. Also, if you want to be that person, Contamination can really shut off your opponents stuff. With Teysa, one black creature is enough for a couple turns of hate. Knight of Autumn , Citywide Bust , Tithe Taker ? I’d replace Citywide Bust with either Settle the Wreckage or Deafening Clarion . 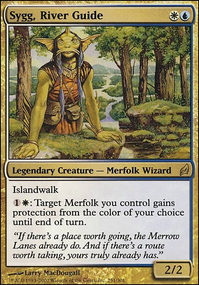 I would include more Tajic, Legion's Edge to mentor your creatures and be a decent blocker since he can be given first strike, he can also protect your creatures from being burned out. You can also do this with Shalai, Voice of Plenty which if you splash green can give your creatures +1/+1 counters. In my experience, Truefire Captain will rarely earn its value because it is slow and awkwardly costed. 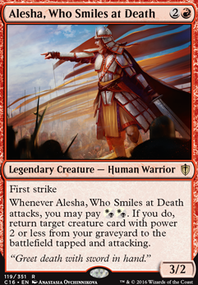 Skyknight Legionnaire is a nice card in limited but it only really earns its spot if you cast it on the third tick of History of Benalia . If you are playing red/white then Justice Strike , Response / Resurgence , and Citywide Bust are great removal. Response / Resurgence has the power to just win at turn five against a lot of decks. If you have 4x History of Benalia , you probably want one or more Benalish Marshal . 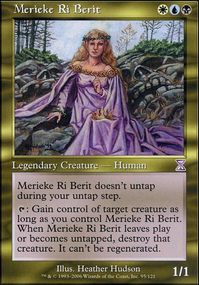 Honestly, once you have that much value, you might as well go for a full tournament History of Benalia list. Darksteel Mutation, Song of the Dryads are especially good at neutering commanders. Dusk / Dawn, Citywide Bust, Fell the Mighty are boardwipes that might leave at least parts of your board but hit everyone elses. And usually no matter how much removal I play [my Zurgo deck has 8 boardwipes and 6-7 single target creature removal spells] I sometimes can still find myself looking for more. 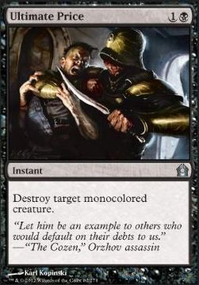 To make room for the targeted discard, I am cutting Citywide Bust and Retribution of the Meek. I like the cards and usually get value off of them, but theoretically they could whiff and not kill anything that matters. 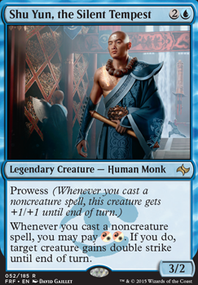 Unless somebody plays a big threat like Jin-Gitaxias, Core Augur, they are probably not worth a card. I am not worried so much about a few large creatures. It is the decks that go wide that cause a problem because those decks can block me effectively. Plus, it seems like I rarely need to sweep the field, I guess because I'm either so fast I'm not worried about what everyone else is doing, or because someone already wiped the board to keep me from winning (which is why I need the discard so much). For now I'll just rely on tutoring for Austere Command in emergencies. jakethewhale007: Thanks for the suggestions! I think you are right on Radiant Destiny. I do tend to pull my board into the grave for sacrifice bonuses, but with my meta we get to 10 permanents super often. 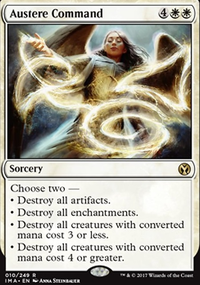 I also agree with Dark Prophecy, I am pretty heavy on black in my mana base, so even though a turn 3 Dark Prophecy is pretty unlikely, it is also unlikely I would get that much benefit off of it super early because it does rely on creature deaths. 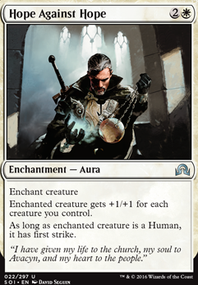 Since it would let my tokens trigger it, it could end up being a lot of card draw when merged with a Skullclamp or other sacrifice effects. I also never liked that Midnight Reaper wasn't a vamp. I have a Citywide Bust so I may throw that in, I think those are good suggestions, unfortunately my deck's biggest competitor in my playgroup is a white/green weenie super widetoken deck, so a lot of times my board wipes are targeted at that deck, so i'm not sure I can afford too much of it. Bloodtracker I would probably trade out another of my higher manacost vampires for him. I'll think on that. Do you feel that single use card-draw is worth it? Should I drop a few vampires for them though, or would you recommend just lowering the amount of removal? Maybe Coding could comment on that. :) Thanks for your suggestions Coding! I think I like Heirloom Blade I'll look into that one more. Necropotence seems hella powerful, would you recommend trading removal for it, or one of the less good equivalents I have?